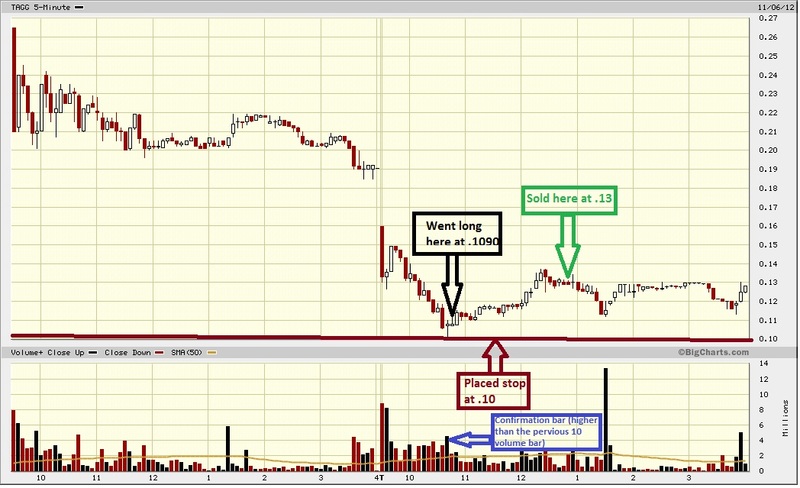 TRADER 9: Trade of the day, TAGG!!! While all the sheep were buying VRNG hoping for it to sky rocket to the moon after the verdict, I was looking for my dead cat bounce. TAGG gap down this morning, but I waited until it reach closer to .10 because these dumps always bounce off .10 than any other price when they're being unloaded, and it was an earlier support level last month. Finally a hammer formed when it reach a low of .1015, I knew I needed to get into the next 5-minute bar after that reversal pattern became apparent with volume higher than the previous 10 volume bars. Bought 50,000 shares at a average price of .1090. I decided to place my stop at .10. Ended up selling at .13 when it failed to get any higher. That is a perfect example of a dead cat bounce.